Find everything you need for the game, from badminton racquets that maximize reach and response to shuttlecocks designed for speed and flight. Shop for badminton racquets, accessories and sets designed for your skill level, from novice players to those skilled at the game. Choose from top brands like Wilson®, Quest® and others to deliver everything you need for your game. Bring energy to your game like never before with strong yet responsive badminton racquets paired with quality, aerodynamic shuttlecocks. 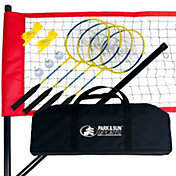 Find complete badminton sets that include racquets, shuttlecocks, nets and other accessories. For a complete game in one package, choose a badminton set that comes with multiple racquets, shuttlecocks and a net. Perfect for those looking for a leisurely game or aerobic workout, badminton is easy to learn and play both indoors and outdoors. Pick out a badminton racquet that delivers the competitive edge you crave. Look for a racquet that provides strength and durability without added weight, so you can return the shuttle with agility. The shuttlecock you choose is a difference-maker in your game. Look for real or nylon feathers that provide aerodynamics and resiliency. A cork tip on your shuttlecock ensures that it is responsive and lightweight. Let your skill level determine the badminton equipment that is right for you. Beginners often look for a stiffer racquet to deliver enhanced strength, stability and precision. More experienced players choose racquets that feature a lower shaft kick point, resulting in increased power without sacrificing control of the shuttlecock. Novice players also prefer vinyl feather shuttlecocks, which provide the best flight, speed and durability for indoor and outdoor play. Advanced shuttlecocks feature top-grade bird feathers that promote flight control.